“Our people crave, more than anything else, to know the extent of the nation,” says the narrator in “Do You Love Me?”, a short story by Peter Carey set on an imaginary world that lionises cartographers. To satisfy that craving, the country carries out a regular, exhaustive census: a “total inventory of the contents of the nation”. Helpful householders even move their possessions—furniture, appliances, utensils, heirlooms—into the street for easier counting. China, like many countries, is keen to know its own extent. This year it is preparing its latest economic census, a twice-a-decade undertaking. Like the census in Mr Carey’s fable, it is a “mammoth task”. The most recent one employed 3m people, counted more than 8m enterprises and estimated a GDP of almost 59trn yuan ($9.5trn at the time). This year’s census may find that GDP per person has exceeded $10,000, enough to form a tidy pile of possessions on the street. But why, many people will ask, does China bother? Doesn’t everyone know that its GDP is “man-made”, as Li Keqiang, the country’s prime minister, once said? Aren’t the data fabricated to support the ruling party’s narrative of fast and steady progress? Why pretend that it is an inventory, not an invention? The critics have plenty of material with which to build their case. China has now reported exactly the same pleasing growth rate (6.8%) for three quarters in a row. 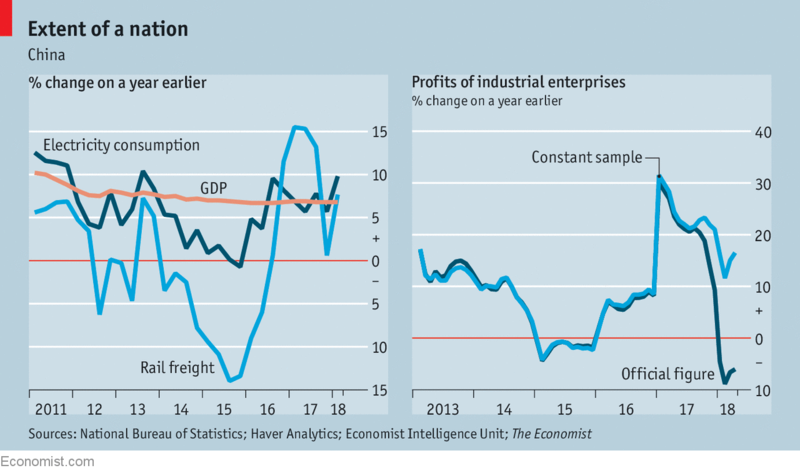 The economy grows robustly even when vital correlates of production, such as electricity consumption or rail freight, do not (see left-hand chart). And China’s national GDP figure is laughably out of line with the sum of its provincial GDP figures. The various levels of government cannot keep their statistical stories straight. In recent weeks, China’s data have invited further scorn. The National Bureau of Statistics (NBS) reported that industrial profits in the first five months of the year amounted to more than 2.7trn yuan, 16.5% higher than a year ago. That would be a reassuring result in the midst of a stockmarket slump. The problem is that this time last year the NBS reported that industrial profits were 2.9trn yuan for the same period of 2017. That would imply a 6% decline from then until now (see right-hand chart). Similar discrepancies have appeared in recent retail-sales figures. In Mr Carey’s strange tale, some parts of the country prove increasingly hard to enumerate. Indeed, these “nebulous areas” become hard to discern at all. Unused for agriculture or industry, they “become less and less real”. Eventually, they dematerialise. Something similar may excuse some of the flaws in China’s data. China’s vast, protean economy is certainly difficult to enumerate. Small firms and self-employed entrepreneurs are hard to track. And the biggest part of GDP is neither agriculture nor industry but “nebulous” services, a growing share of which are provided digitally or purchased implicitly, such as the accommodation that a home can provide to the people who own it. These measurement difficulties may help explain some of the oddities that harsher critics delight in pointing out. It is true, for example, that China’s quarterly GDP figures are implausibly smooth. But so are Indonesia’s. That suggests mismeasurement may be as much to blame as manipulation. For the quarterly numbers, points out Carsten Holz of Hong Kong University of Science and Technology, the NBS can draw on the data reported directly to it by large enterprises (those with annual revenues of over 20m yuan). But it remains largely in the dark about smaller firms. Big enterprises are disproportionately state-owned. They tend to lumber along at a steadier pace than their private rivals, which respond more adroitly to market ups and downs. For the rest, the NBS must make educated guesses, which will err on the side of continuity. Many critics who quote Mr Li’s scepticism forget that he was talking about Liaoning, the province he once oversaw, not China’s national figures. Several provinces have since admitted that their figures have been grossly overstated, presumably to help local leaders win promotion. It should therefore be a source of reassurance, not scorn, that China’s national GDP number is not simply the sum of its provincial numbers. Indeed, the NBS has its own survey teams in many parts of China and requires large enterprises to report data to it directly. That cannot prevent the firms misreporting figures, but it does stop direct meddling by local officials. And next year the NBS will take more centralised control of provincial GDP numbers. Some of China’s recent statistical embarrassments may stem, paradoxically, from its efforts to improve matters. For example, the industrial profits recently reported by large enterprises were lower than those reported last year because some under-sized and double-counted firms were purged from the sample. Retail-sales figures were also revised in light of a new survey, making them incomparable with those reported last year. Mr Carey’s story ends badly for the statisticians. As the world becomes more nebulous, the census-takers succumb to political pressure, faking information missing from their surveys. Even so, they are blamed for the disappearance of things they cannot measure. Once respected, they become disdained. China’s census-takers should be more open about what they can and cannot measure, inviting outsiders to cross-check their results. In admitting what they do not know, they will gain credibility. Their past opacity has shielded them from searching criticism, but exposed them instead to the laziest disdain.